Avesta -- Zoroastrian Archives - What's new? Feb 5, 2019: Added Ashishvangh Yasht (Ard Yasht), courtesy of Soli Dastur. Feb 4, 2019: Added Vendidad-Baa-Nirang: Vendidad ceremony with Vendidad, Yasna and Visperad prayers and accompanying rituals performed during an actual Vendidad ceremony. Kindly contributed by Ervad Jal Noshirvan Panthaky. Feb 4, 2019: Added Vendidad Saadeh: Only 22 Fargarads (chapters) of Vendidad. Kindly contributed by Ervad Jal Noshirvan Panthaky. Oct 25, 2018: Added many articles and reviews of Dr. Antia's. June 12, 2018: Added Dr. Antia's article Humanitarianism as the Cornerstone of Zoroastrianism. May 9, 2018: Added Book Review. Conflict and Cooperation — Zoroastrian Subalterns And Muslim Elites In Medieval Iranian Society by Jamsheed K. Choksy, reviewed by Dr. Kersey Antia. Feb 9, 2018: Added 1001 names of Ahura Mazda — enumerated, kindly contributed by Sam Kerr. Jan 19, 2018: Added Dr. Antia's article: The Question of Assyrian Influence — a review of Simo Parpola: "The Originality of Teachings of Zarathustra in the light of Yasna 44" (2004). Jan 19, 2018: Added Dr. Antia's article: Romano Persian Rivalry for the East-West Trade: Trade relations between Iran and India from prehistoric times as a contributing factor to the Parsi pilgrims settling in India. Jan 17, 2018: Added Dr. Antia's article: A Prayer Guide: Suggested prayers for all occasions. Jan 13, 2018: Added Dr. Antia's review of The Talmud in its Iranian Context, Bakhos, Carol, and M. Rahim Shayegan. Tübingen: Mohr Siebeck, 2012. Jan 12, 2018: Added Dr. Antia's article, The Navjote Ceremony — A Zarathushti Initiation. Jan 11, 2018: Added Dr. Antia's article, The Gist of the Jashan celebration. Added Dr. Antia's article, A Guide to Prayers for Departed Loved Ones. Jan 10, 2018: Added Dr. Antia's article, A Brief Biographical Sketch of Dastur Bode. Added Dr. Antia's article God’s Good Rule, Vohu Kshathra. (To be Chosen by Man), originally published in An Introduction to the Gathas of Zarathushtra, edited by Dina G. McIntyre. Added Dr. Antia's article Gathic Thought East of Persia — A Quest Long Overdue. Jan 7, 2018: Added Dr. Antia's paper, Fire and Fire-temples in Zoroastrianism Through the Ages. (2018, used with permission). Nov 13, 2017: Added full text of Dr. Antia's book The Argument for Acceptance in Zoroastrianism, with an appendix on the status of women in Zoroastrianism. Copyright © 2015 Kersey Antia. Used with permission. Also available in print. Nov 7, 2017: Updated audio recordings page. Aug 23, 2017: Added Behram Yasht (Warharan Yasht), courtesy of Soli Dastur. Jan 1, 2017: Added Middle Persian text The Day Khordâd of the Month Farvardin, Commonly Called Khordad-sal. Oct 9, 2016: Added Dinshaw J. Irani, Understanding the Gathas. Used with permission. Sep 23, 2016: Added "Khushaali Nu" Jashan Prayers for Celebrations Occasions with English Translations by Ervad Soli Dastur. Jun 26, 2016: Added šak-ud-gumanih-vizar -- The Doubt-removing book of Mardanfarrox, edited and translated by Raham Asha (2015). Used with permission. Mar 2, 2016: Added audio file of Satum Kardaa prayer and accompanying booklet, courtesy of Soli Dastur. Dec 28, 2015: Added T.D. Anklesaria's Yasna Ba Nirang, courtesy of Soli P. Dastur. Dec 20, 2015: Added audio file of Srosh Yasht Hadokht prayer, courtesy of Soli Dastur. Dec 6, 2015: Added audio files of Patet Pashemani and Patet Rawan Ni prayers, courtesy of Soli Dastur. Oct 26, 2015: Added article by Sam Kerr of Gaumata — the rebel Maghavan. Aug 25, 2015: Dr. Kersey Antia's book The Argument for Acceptance in Zoroastrianism , is now available. It includes an appendix on the condition of women in Zoroastrianism. Aug 22, 2015: Sam Kerr published his newest book Cyrus the Great — Celestial Sovereign (2015). Aug 14, 2015: Added Shahanshahi Calendar 2015-2016 courtesy of Sarosh Manekshaw. May 5, 2015: Added article by Sam Kerr on the advent of the word, "GOD". Mar 3, 2015: Added audio recordings of Pazand Ashirwad with Afrin Buzorgaan and Doa Tandoorasti and Sanskrit Ashirwad to collection of audio recordings, courtesy of Ervad Soli P. Dastur. Feb 28, 2015: Added Farokhshi prayer to collection of audio recordings by Ervad Soli Dastur. Feb 26, 2015: Added Geh Saarnaa prayer to collection of audio recordings by Ervad Soli Dastur. Jan 2, 2015: Added PDF of Yasna in Avestan characters (din dabireh). Nov 21, 2014: Added recordings of Ormazd and Aban Yashts, courtesy of Soli P. Dastur! 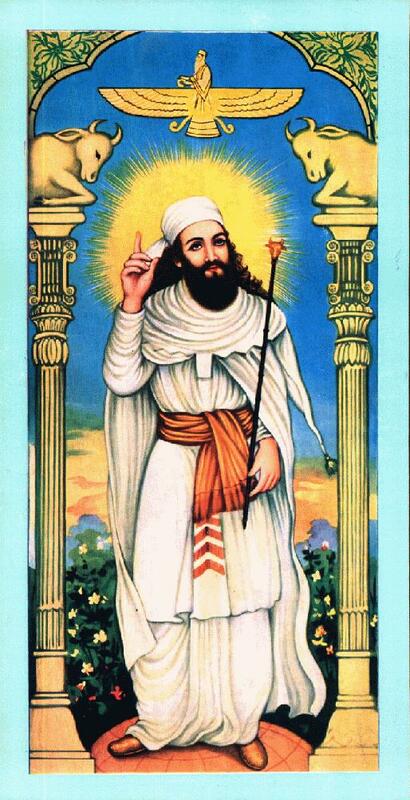 Oct 28, 2014: Added 76 articles by NAMC with weekly quotes from Zoroastrian scripture. Sep 21, 2014: Removed envolve chat service. Aug 17, 2014: Added Shahanshahi Calendar 2014-2015 courtesy of Sarosh Manekshaw. Jul 2, 2014: Added article by Sam Kerr on the mystique nature of touch. Jun 14, 2014: Added EPUB versions of Bundahishn and Greater Bundahishn. Apr 22, 2014: Added directory of EPUB documents. Apr 22, 2014: Added EPUB version of Modi's book Religious Ceremonies and Customs of the Parsees. Apr 22, 2014: Added PDF and EPUB versions of Dastur Dhalla's History of Zoroastrianism. Dec 9, 2013: Added Maneckji Pithawalla's Steps to Prophet Zoroaster (1916). Dec 5, 2013: Added complete book by K. E. Kanga: Gâthâ-bâ-maâni: transliterated and translated into English Scanned by Soli Dastur. Used with permission. Dec 5, 2013: Added complete book by K. E. Kanga: Yasht-bâ-maâni: transliterated and translated into English Scanned by Soli Dastur. Used with permission. Nov 1, 2012: Added Persian Khordeh Avesta, with text, translation, and commentary by Mobed Azargoshasp (3rd ed. 1354). Apr 1, 2012: Added PDF of Vendidad text in transcription font. Mar 17, 2012: Added new article The much-revered Domestic Rooster by Sam Kerr. Mar 16, 2012: Fixed typos in PDF and HTML versions of Modi's book Religious Ceremonies and Customs of the Parsees. Feb 1, 2012: Added two new articles by Sam Kerr. Jan 28, 2012: Added several articles by Sam Kerr. Jan 26, 2012: Added article by Dr. Kersey Antia on Views of Scholars Refuting Zoroastrian Influence. Jan 06, 2012: Added The Geneology of the Naosari Priests, courtesy of Ervad Noshir Hormuzdiar. Dec 29, 2011: Added twelve articles by Sam Kerr. Nov 29, 2011: Added PDF version of Modi's book Religious Ceremonies and Customs of the Parsees. Nov 27, 2011: Added PDF and EPUB versions of Denkard, Book 4. Nov 18, 2011: Added chapter 34 and footnotes to Selections of Zadspram. Nov 15, 2011: Added PDF and EPUB versions of the Selections of Zadspram. Nov 14, 2011: Expanded collection of prayers on mp3. Nov 6, 2011: Added PDF and EPUB versions of the Qissa-i Sanjan. Nov 3, 2011: Added PDF and EPUB versions of Denkard, Book 3. Oct 23, 2011: Added PDF and EPUB versions of Denkard, Book 5. Oct 20, 2011: Added PDF and EPUB versions of the Vendidad translation. Oct 15, 2011: Added list of animals to Avestan vocabulary page. Jun 27, 2011: Added PDF version of Khorda Avesta (English) edited by Ervad K. E. Kanga. Jun 24, 2011: Added PDF version of Visperad transcription. May 3, 2011: Added two Open Type fonts for use with Avestan and Pazand. Apr 24, 2011: Added epub version of Khorda Avesta for your iPhone or other ebook reader. Mar 26, 2011: Updated list of groups and associations. If I left yours off, please let me know. Jan 30, 2011: Added Patet Pashemanom (Prayer of repentance). Jan 18, 2011: Added 101 Names of God. Dec 27, 2010: Added article by Sam Kerr on The glory of Dawn. Dec 11, 2010: Added B. T. Anklesaria's translation of Zand-I Vohuman Yasn. Dec 1, 2010: Updated Sam Kerr's Book The Sassanian Dynasty to include higher resolution photos. March 26, 2010: Added Envolve chat service. Sep 4, 2009: Completed Modi's Religious Ceremonies and Customs of the Parsees. Aug 16, 2009: Added chapter 16 (The Afrinagan Ceremony) and chapter 17 (The Farokhshi) of Modi's Religious Ceremonies and Customs of the Parsees. Aug 9, 2009: Added chapter 13 (Visperad), chapter 14 (Vendidad), and chapter 15 (Baj) of Modi's Religious Ceremonies and Customs of the Parsees. Aug 1, 2009: Added chapter 12 of Modi's Religious Ceremonies and Customs of the Parsees. -- The Yasna Ceremony. Oct 12, 2008: Added chapters 10-11 of Modi's Religious Ceremonies and Customs of the Parsees. (consecration of the towers of silence, consecration of the ritual objects (alat). Jun 26, 2007: Updated Sassanian Dynasty -- Historical Perspective, by Sam Kerr. Feb 4, 2007: Translation of The Woodcutter and his Fortune (Mushkel Aasan) kindly updated by Dhun Madon and Cyrus Madon. December 5, 2006: Added 2007 Gregorian-Fasli calendar. December 5, 2006: Added Sassanian Dynasty -- Historical Perspective, by Sam Kerr. August 19, 2006: Added chapters 7-9 of Modi's Religious Ceremonies and Customs of the Parsees. (initiation ceremonies, consecration of the sacred fires). June 29, 2006: Added Quick Facts about Avesta.org. March 24, 2006: Added chapter 6 of Modi's Religious Ceremonies and Customs of the Parsees. (purification in daily life). January 4, 2006. Added Presentations on Jashan by Soli Dastur (Rituals section). October 22, 2005: Added chapter 5 of Modi's Religious Ceremonies and Customs of the Parsees. (Barashnom and Riman ceremonies of purification). July 27, 2005: Added Teach Yourself Avesta Language by Dr. Ervad Ramiyar Parvez Karanjia (2005) Used with the kind permission of Dr. Karanjia, Principal of Dadar Athornan Madressa in Mumbai India. July 8, 2005: Added chapter 4 of Modi's Religious Ceremonies and Customs of the Parsees. September 29, 2004: Added Epistles of Manuschihar. September 4, 2004: Added Bejon N. Desai's books Learning Avesta Compendium (2003) and Learning Avesta Manual (2004). Used with permission kindly acquired by the help of Nader M. Patel, Mumbai, and scanned by Soli Dastur. July 25, 2004: Added E.S. Drower's Peacock Angel, part 3. July 20, 2004: Added E.S. Drower's Peacock Angel, part 1 and part 2. June 17, 2004: Added J.J. Modi's My Travels Outside Bombay: Iran, Azerbaijan, Baku translated and kindly contributed by Soli Dastur. June 9, 2004: Added birth ceremonies and customs from Modi. Jan 5, 2004: Added Dastur Dhalla's History of Zoroastrianism. Coedited with Soli Dastur. December 9, 2003: Added Dhalla, Saga of a Soul -- An Autobiography edited and kindly contributed by Soli Dastur. Sep 6, 2003: Added Zoroastrian calendar calculator (Shahanshai, Kadmi, and Fasli dates for any calendar year. Kindly contributed by Soli Dastur. April 29, 2003: Added Khorda Avesta (English) edited by K. E. Kanga, kindly contributed and scanned by Soli Dastur. April 28, 2003: Added Khorda Avesta (Gujarati) edited by K. E. Kanga, kindly contributed and scanned by Soli Dastur. April 3, 2003: Added a gallery of paintings depicting the life of Zarathushtra. March 11, 2003: Added Chatterji's translation of the Gathas. Kindly contributed by the Calcutta Parsi Anjuman and Sohrabji Panthaky, and scanned by Soli Dastur. Jan 11, 2003: Consolidated Avestan dictionary into a single file for easier searching. September 21, 2002: Added scans of Sunjana's Pahlavi Grammar. August 24, 2002: Added scans of Kanga's Avesta Grammar, Kanga's Avesta-Gujarati-English Dictionary, and Kanga's English-Avesta Dictionary. Kindly contributed by Soli Dastur. May 4, 2002: Completed Greater Bundahishn. April 14, 2002: Added chapters 12-26 of the Greater Bundahishn. March 23, 2002: Added chapters 1-11 of the Greater Bundahishn. March 2, 2002: Added introduction to the Greater Bundahishn. February 21, 2002: Added The Yatkar-i-Zariran or Memoirs of Zarir (kindly contributed by Chris Weimer). July 7, 2001: Expanded footnotes to Vendidad; updated Forthcoming Events. May 24, 2001: Added remaining chapters of The Book of Arda Viraf which had been censured by Horne. 08/06/2000: Added information on supplier of phetas and pagdis and updated list of organizations to include information on Tehran anjuman. 01/23/2000: Added 23 chapters of the Persian Rivayats including commentaries on the Ashem Vohu prayer, perjury, sacred fires, sacred myths, being grateful, barsom, the end times, dreams, and cosmology. Updated new and forthcoming books list to include Ichaporia, Pallan and Helmut Humbach, Concordance of the Gathas, With Gathic Avesta, Pahlavi and Sanskrit Texts, Translations, and Commentary. Harrassowitz, Germany. Added Fasli calendar for the year 2000. 10/22/99: Added Denkard, Book 3, intro and chapters 25-65. 09/28/99: Added the 30 Setayashes (Pazand prayers praising each day of the month). 09/21/99: Added German translation of Yasna 9-11. 05/11/99: Added The woodcutter and his fortune (Mushkel Aasan) translated and kindly contributed by Dhun and Cyrus Madon. 10/15/98: Added parts 3-13 of the Dabestan. This completes volume 1 (Parsi sects). 09/26/98: Added part 15 of the Dabestan. 08/22/98: Added part 2 of the Dabestan. 08/04/98: Added part 14 of the Dabestan. 07/30/98: Added first part of Dabestan-e Madaheb ("School of religious doctrines"): a seventeenth-century description of many religions and occult practices prevalent in India at that time. 06/20/98: Added navigation tags to Vendidad. 03/06/98: Fixed bad links, added language tags, and added navigation tags throughout.